INTRODUCTORY PRICE OFFER FOR LIMITED TIME ONLY. Brand New for the 2016 Specifications. This photocopiable book has been created around Edexcel’s A Level, Component 1: Devising. 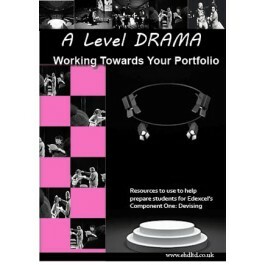 The book provides a complete set of resources and handouts to use with your students when they are exploring a key extract from a performance text and then creating their own devised piece.The wealth of sheets can be used to help students start to plan their ideas both for their devised piece and for eventually writing their portfolio submissions. The sheets will help students to record and analyse how they manipulate the extract into their own devised piece, using their own styles, conventions and the conventions of their chosen practitioner. a. An introduction to the assessment of this module. 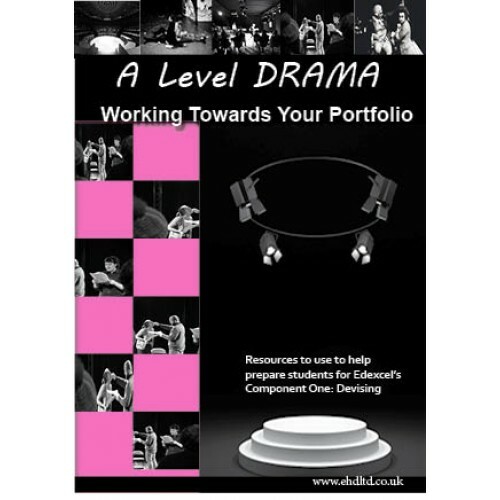 This chapter contains resources which outline how this module will be assessed and will help students to prepare students for the notion of creating a devised piece and portfolio. It contains useful sheets to use with your groups such as rehearsal log sheets and shows them, from their very first lesson, what they will need to record and evaluate as they work to create their devised drama. This section contains resources you could use when exploring your initial key extract of a play or trying to deconstruct your chosen extract. This section contains sheets to use with students to encourage them to log their own initial reactions to the extract and the sheets will show them how to explore some of the main ideas, themes, messages, characters, theatrical styles and conventions. These will be useful to look back at when eventually writing their portfolios. If you have students who are opting for a design role (costume, lighting, set or sound) the student sheets in this section will be invaluable. They will help them to analyse and evaluate their creative choices in relation to their own ideas and the methods of their chosen practitioner. They cover all of the four design aspects in detail encouraging them to look at more complex and original aspects of the design area when creating their choices. This section might also be useful for the performance students who want to gain an overall understanding of how their devised piece will work on stage. This section will provide assistance to those in your class who have opted to take a performance role in their devised piece. It contains resources to help students analyse aspects such as their desired acting style with a detailed focus upon both naturalistic and stylised styles, sheets that will assist them when creating or evaluating their vocal decisions and choices, sheets to analyse how they can depict characterisation through facial expressions, and sheets that will help them to analyse and evaluate the use of spatial positioning within their performance. The sheets could be used throughout their rehearsals to generate ideas for their devised piece, or they could be used when the students are ready to start writing their portfolio. If used during the rehearsal stage, the sheets will ensure that students evaluate and analyse their performance decisions throughout their working processes and help them to see how their characters emerge from initial performance ideas and rehearsal work-such records and notes will be invaluable to students during their final writing of the portfolio. This section contains sheets that will help students to analyse how social, historical and cultural contexts have impacted on both their own performance ideas and the ideas of their chosen practitioner. This section also contains sheets that students can use to help analyse how their ideas have been influenced by their selected practitioner and the impact that live theatre might have had on their ideas. They can then use these ideas within their portfolios. All of the sections will ensure that your students are never short of ideas when they finally come to write their own portfolio after they have created their devised piece of drama.